That’s basically a good summary of the weather we had over the last ten days. And I can even be a bit more precise: the first day it was nice, sunny weather and then the next day was horrible. Followed by another sunny day, and another horrible day. I could just CTRL-C and CTRL-V this last sentence. A pattern emerges, which (surprisingly) coincides with the person on the tiller. Sunny day? Slight breeze? It’s Lawrance’s day on the tiller? Snowstorm? Gale force winds? Ice rain? Minus 20 degrees? My day on the tiller. The only time I’m on the tiller in bright sunshine is when I take WRT through the tunnels (Lawrance is useless in tunnels). And even then there is a slight unfairness: there is no sun in the tunnels, Preston Brook tunnel has at least two showers, while Saltersford tunnel and Barnton tunnel are not dry either. To be honest, the first three days were not too bad. 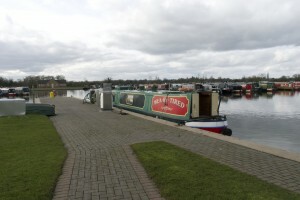 We leave Scarisbrick Marina on Friday the 26th, around noon. A bit late, but the weather is fine and we make it all the way to Crooke. 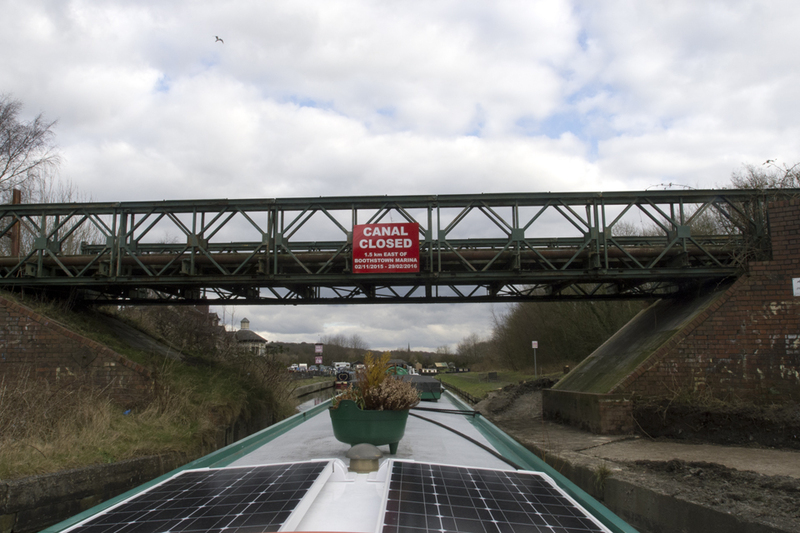 Thanks to a voluntary lock keeper, who’s locks (Wigan Flight) are closed for maintenance, and he wants to keep up his skills. 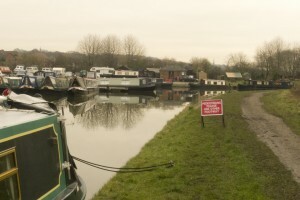 The reason for the discussion is the stoppage just before Worsley. There are signs all over: Canal Closed, and the Bridgewater Canal website has no more information either. So we stop at Leigh to do some shoppings at Aldi (wine…?) and stop for the day at Boothtown Marina. We’re getting information that the canal is open, but can’t be bothered. And how to get to the other side? On the Monday it’s my day again. 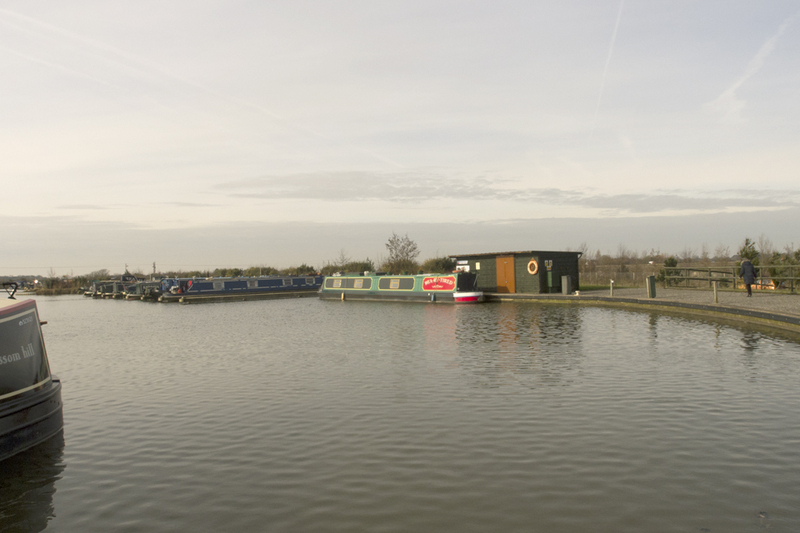 It’s cold, and the canal is partly frozen, as you can see on the picture of the safety gates (left of the boat). 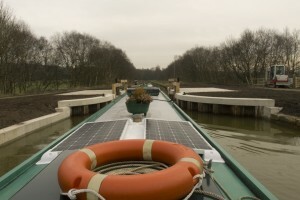 The canal indeed is open and we make Lymm without any problems. Except for the fact that, by then, I’m frozen to the bone. I can’t put on more clothes, I feel like a Michelin man already, with a thermal under-shirt, thermal Long Johns, jeans, a poloshirt, a jumper, a fleece, and my high-vis waterproof jacket that also has a fleece. The next day it’s pouring down with rain. This is not logic: it’s Lawrance’s day on the tiller. Ann and Mick decide to stay in Lymm for now, Lawrance has to brave the elements. But as soon as we’re on our way the weather realises it’s mistake. The rain stops, and the sun comes out. We find out today that with leaving Lymm around the full hour one can ‘sail’ through all three tunnels without having to stop. Ann and Mick do the same, but an hour later. We end up in Anderton, and have an excellent meal in the Stanley Arms. Wednesday it’s me again. Same amount of clothes, but instead of my high-vis jacket I wear Lawrance’s waterproof fisherman’s jacket. That should be warmer. Between Wincham Warff and Broken Cross I see a white thing, in the air in front of me. I think: snow? Nae, that can’t be right. Well, ten minutes later I consider mooring up: I cannot see the canal anymore because of the snow! Luckily, after an hour or so, the snow stops… and the winds starts. No, not a slight breeze, gale force wind. WRT is doing fine, but I nearly get blown off the boat! And it is not over yet. Just before Stanthorne lock I have to moor. I can’t go on, it hurts too much: ice rain. The ‘rain’ cuts into the skin of my face, and when it gets in my eyes…! When this ice rain stops I only have to negotiate a couple of bridge with the sun right in my face (and reflecting on the water) before we get to Church Minshull. 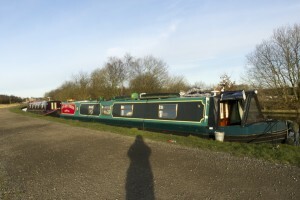 Except for a bit too much mud on the towpath this mooring is fine. We walk to the Badger Inn for an absolute delicious meal, and the owner of the pub takes us back to the boat in his car. Brilliant! On Thursday the 3rd I see my first Kingfisher, a good start of the day. The weather makes the same mistake as last Tuesday, and again realises it after half an hour. But it makes Ann and Mick stay for a while. We do the final stretch to Swanley Bridge Marina. Go through the smallest lock on the canal (Hurleston no.4) and moor up in the marina, right in front of the office. We’ve done 84 miles, 5¼ furlongs, with 21 locks, five swing bridges and one lift bridge. Ann and Mick are still in walking distance. They’re in Nantwich, and when Lawrance is on his way (in an Enterprise rental car) to Scarisbrick Marina to get our own car, Ann finds out that it is a 30 minutes walk to visit me. We spoke to Sally, the painter, made decisions about colours, and on Tuesday the 8th WRT will be taken out off the water. Wow, that seems like a very eventful trip! Nice to read up on it, thanks for posting. 🙂 Hope the weather will improve from now on, I’m more than ready for spring to set in! 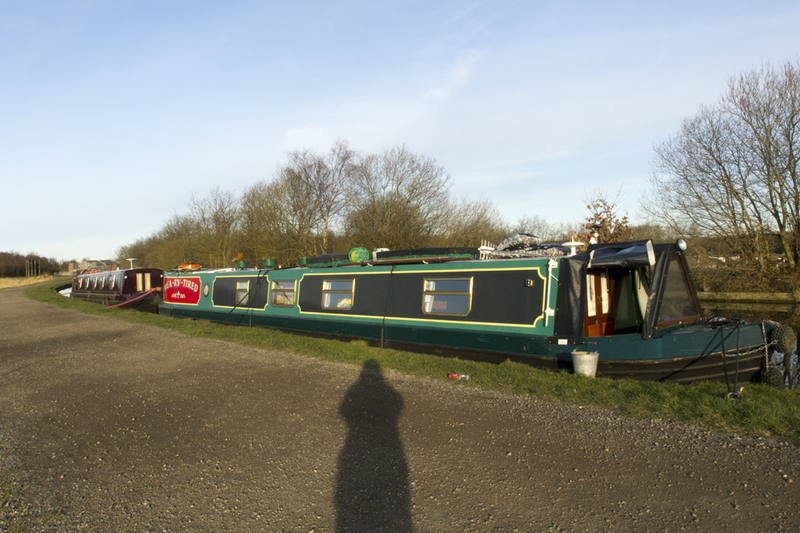 Looks like you have had quite a adventure….were down at ours sometime towards the end of this month..just to check everything OK….then off for the summer at the start of May…..hope to see you on the cut! !…..